Another entry in the Call of Duty series and the fourth entry in the Black Ops sub-series. It was developed by Treyarch. Contrary to the previous installments, Call of Duty: Black Ops IIII lacks a single player campaign. 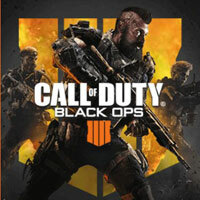 Black Ops IIII is another entry in the Call of Duty series and the fourth installment in the Black Ops sub-series. Similarly to the previous Black Ops games, the title was developed by Treyarch and the PC port was created in cooperation with Beenox Software. The game was published by Activision-Blizzard. Call of Duty: Black Ops IIII takes place between the events presented in Call of Duty: Black Ops II and Call of Duty: Black Ops III. Contrary to the previous games in the series, the title lacks a singleplayer campaign. Instead, the developers decided to tell the story of various Specialists through the multiplayer mode. The action in Call of Duty: Black Ops IIII is presented from a first-person perspective. The game introduces various changes to the gameplay mechanics. The most important one is the lack of automatic health regeneration. Now the players can heal themselves manually when the time is right. The developers also removed the wall running and thrust jumps. The weapons are never pulled down and it is possible to shoot even while climbing or using the grappling hook. In multiplayer mode, the players assume the role of specialists. Each of them features a unique set of combat skills, advantages, and weaknesses. Taking advantage of these differences is the key to victory. For example, Recon’s specialization is the situation awareness – everything that can be seen or heard during the fight. He can reveal the fog of war from the minimap with a special sensor and show the locations of enemies to his allies. During the game, the players can use various weapons. Each weapon features a set of add-ons, including operator modules – special items that behave differently depending on the specialization of their user. Multiplayer is the pillar of Call of Duty: Black Ops IIII. It focuses not on individual battles, but on team-based play. The game also introduces a battle royale module called Blackout. In Blackout, the players are taken to a vast map (about 1500 times larger than the famous Nuketown) that features things taken from the most popular maps in the series. The map can be traveled through on foot or by using vehicles and machines (including boats, planes, and cars). The players assume the role of classic characters from previous entries in the series and in order to win one player must become the last man standing. Black Ops IIII also features a Zombie mode that starts a new story. During the game in this mode, the players assume control of nine characters that face ancient, evil order. It is worth mentioning that the zombies can be fought together with other players or with companions controlled by artificial intelligence. Call of Duty: Black Ops IIII is powered by an improved version of the engine that was used in previous games in the series. The PC version of the game supports 4K resolution and ultra-wide displays. It was also integrated with Battle.net service. Guide to Black Ops 4 is primarily a collection of practical tips for beginners in multiplayer games. We describe all game modes, including Zombie mode and battle royale mode (blackout).